KOKONOE RW-99 melt at lower temperature and the lower viscosity of the melts results in an adhesive layer of more uniform thickness. The melts from KOKONOE RW-99 solidify in a shorter period of time and show a stronger adhesion force. KOKONOE RW-99 absorb the strains caused by heat shrinkage. 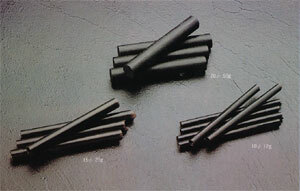 KOKONOE WR-99 are easily soluble in hydrocarbonic solvents, and thus can be readily washed out. The blackish brown color of KOKONOE RW-99 enables you to easily detect greys and streaks on a lens. ☆ For 5 seconds at 25℃ under 100g load. ★ For 60 seconds at 25℃ under 200g load. Remarks:The above are typical analysis data (Not specifications).